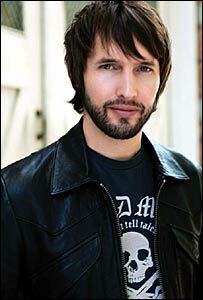 James Blunt's love songs endeared him to millions after he burst onto the music scene in 2004. But the man seen as a sensitive singer-songwriter has chosen to celebrate the hedonistic nightlife of Ibiza in his new single, 1973. The title comes from the year the Balearic island's iconic Pacha nightclub opened. "In 2006 I spent far too much time there," he explains. "So it's about the time I spent with my friends, it's a celebration with a sense of nostalgia." The former army officer has a home on the island and spends much of his spare time there. He was a dedicated clubber before hitting the big time, he reveals. "I'd been out about eight different times in eight years," he explains. "I think the clubbing scene's still pretty healthy - there's people on package holidays and people on the higher end of the scale. That's the nice thing about it, there's a healthy mix." But aside from his nights out, Ibiza provided an escape from the music business and space in which to write the new album, All The Lost Souls, over the winter. "It's a good place to get away from the noise of everyday life," he says. "It wasn't about getting away from the UK, it was just about getting involved in writing in a quiet place - if there's a lot of noise it's just too hard." After a rather lonely start in the business, Blunt now says he is writing with more confidence. He also now has the luxury of a band to write for, after playing all the instruments on debut Back To Bedlam. "The first time I didn't know if anyone would hear it," he says. "This time around, I know I can take it to my five bandmates and their expertise. "And that band came in the studio with me, bringing their musicianship, so the result is a deeper and richer musical experience. 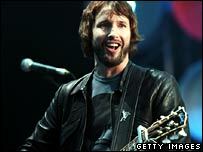 "I'm still writing the songs myself, and I'm quite happy just pulling out a guitar and playing. But I have the flexibility of the band, and on the road it's much nicer to be with a bunch of mates." Blunt has spent the last three years in the tabloid spotlight, but remains cynical about coverage that portrays him as a ladies' man. But he deals with that on All The Lost Souls. "That's just perceived reality - in entertainment news, the emphasis is on entertainment. 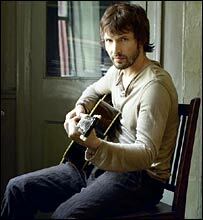 I'm a human first and foremost and being a musician is my job," he explains. "There are different songs which deal with the last three-and-a-half years. I've gone through those experiences as a regular person so the songs deal with it from a very human perspective." But his fame enabled him to return to his former life in the army, going back to Kosovo - where he served for six months in 1999 - to make a documentary. He left with mixed emotions. "I wanted to see if it was really worthwhile being there for six months - we'd invested time and energy and life into it," he says. "It as amazing going back, there were some good aspects - some progress there - and other things were sad to see. With the blood spilt in that area, the repercussions go on for generations." But Blunt feels events in the Middle East have meant the Balkans have been overlooked by the wider world. "I think our army is busier than it's possibly ever been, and there's fewer of them doing that job than there's ever been," he says. "It's incredibly tough at the moment. Soldiers are people who work incredibly hard and don't get much time to be distracted from the job, so they're always appreciative and it was nice to see a bunch of them." Would he consider performing in the Middle East? "I'd definitely think about it - away from politics, soldiers in our army are just issued with a uniform and they're just regular men and women, doing whichever job our government puts them towards," he says. But for now, after "being locked up in a studio for too long", Blunt is back on the promotional trail, and preparing for a full tour in the new year. "It's really nice to be back home, and it's really nice to have some new songs," he says. "The band and I had a great time in Los Angeles making this album and we're over the moon with it." 1973 is out now. All The Lost Souls is released on 17 September.